So, two days before packing my rucksack, John posted a picture on Facebook. Well, not a picture, a route-map. The map of the GR242 50-mile walk I’d signed up for. With a profile chart of the height gained each day. Uh-oh. It was his 50th birthday, and he’d invited a whole bunch of us to donate €50 to Cudeca (the local cancer support charity) and walk 50 miles with him to celebrate (yeah, I know – whatever happened to a few drinks down the bar?). 50 miles “downwards” from Periana, high up above the Viñuela reservoir near the Zafarraya Pass, gradually dropping down to Maro, just above the sea at Nerja. Except “downward” didn’t really tell the whole story. 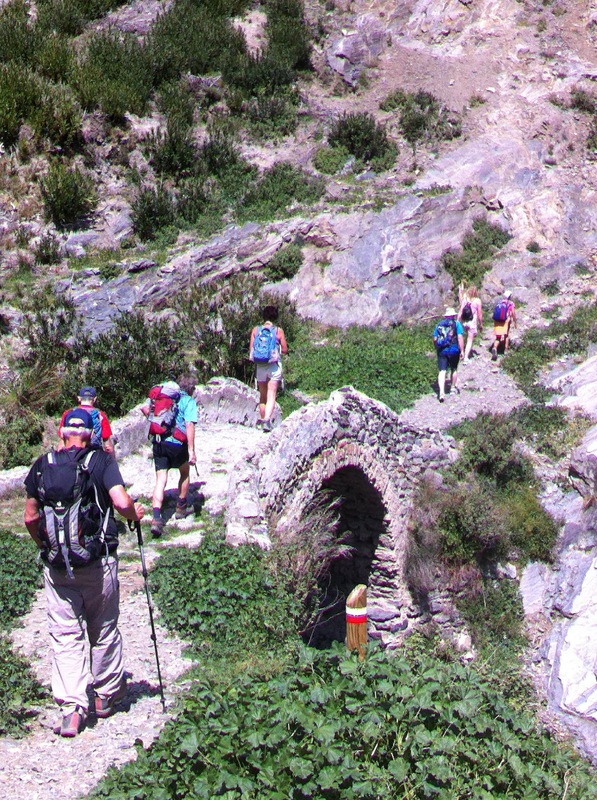 Yes, you can start at 1250 metres altitude and end up at sea-level, but that doesn’t mean it’s a downhill stroll. No indeed. The map arrived, and the altitude profile chart. It had a lot of pointy-uppy bits. A knot of worry settled into my stomach. The day dawned. Sandwich in rucksack, boots and t-shirts packed, I drove to the finish-line at Nerja and parked near the bus station. 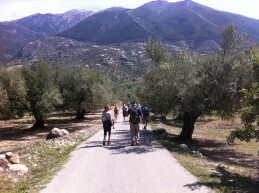 Our special bus was ready and by 10am we decanted at Periana and The Long Walk began. There is something very romantic about the sound of the GR routes. “Gran Ruta” or “Gran Recorrida” in Spanish, “Grand Route” in English and French. They criss-cross Europe and have standardised wooden posts with red and white rings to mark the way. The Tour de Mont Blanc is one. I did that one, but more than a couple of decades ago. When I was young. And fit. And thin(ner). This is a GR as well, though admittedly not quite in the same league. Beautiful March weather. We can see the sea twinkling ahead of us. A mere 50 miles separates us from our goal. 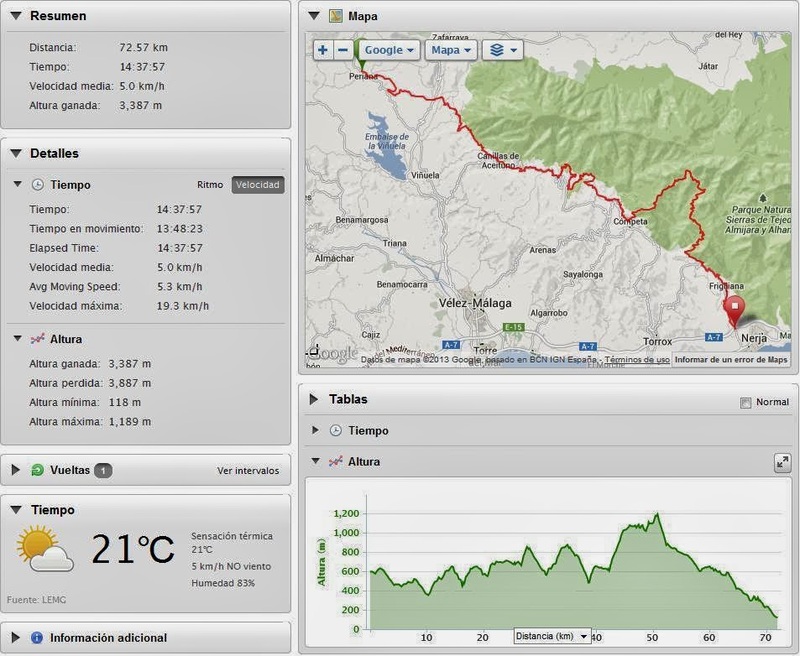 Oh and the little matter of over 3,000 metres of climbing. Hmmm. METRES. We started in my patch. New to everyone else, we were up above the east side of Viñuela reservoir the whole day, and for most of the day we could see Colmenar! The morning broke us in nicely, being mostly a decent track from Periana (where the official start photo was taken) to Alcaucín where a row of wall fountains proved to be a magnet after the hot morning. The young man in Bar Enrique wasn’t wholly prepared for the sudden arrival of 30 thirsty walkers, but raised no objection to the annexing of his terrace to eat our sandwiches. “We’ve done two thirds” said John confidently. And so began four days of Irish-isms. Because he didn’t say “thirds” he said “turds”. And we were to hear daily from John and the number of successfully completed turds …. The finger-post leading us out of Alcaucin towards Canillas de Aceituno said 6.6 kilometres more. The track petered out and delved into a cool pine forest, then plunged down into a deep ravine, leaving us scrambling up the other side. Up at the front, Tracey and I briefly became accidental leaders, our slightly sceptical followers only cheering up when Tracey called out with delight on finding another official way-post. The final climb of day one felt longer than it was, and the sight of Bar La Maroma was a welcome one. 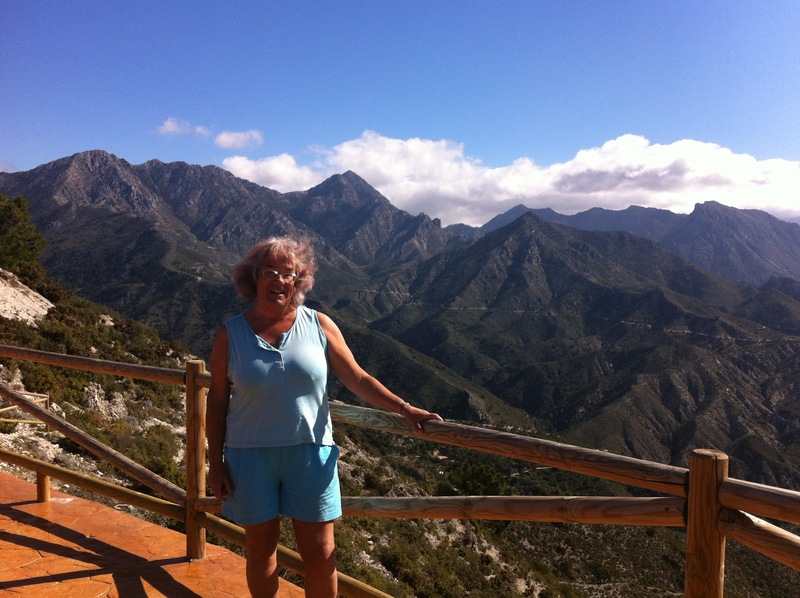 Especially for Joan, whose plea to a passing truck for a lift to the village (just 500 metres away but the hard road was gruelling underfoot) almost had her whisked 40 miles away to Velez-Málaga as the kindly driver mistook her soft Irish pronunciation of “village” to be “Velez”. Beers, coffees and juices all round, then Paco led us round the village dividing us amongst three houses. He had fixed for us to have dinner, bed, breakfast AND a packed lunch for just €40 a head. Fine rural hospitality. Day two dawned and it wasn’t only me that looked longingly at the car that was taking our bags to the next overnight stop. In Sedella we piled into Maria’s bar before descending further to the well-preserved Roman bridge. Under the baking sun I thanked for the umpteenth time my distant ancestors on my father’s side who put a Sicilian gene somewhere in my make-up, ensuring that I go a decent olivey-brown without burning. On to the pretty aldea (somewhere between a hamlet and a small village) of Salares, then to Canillas de Albaida, and finally to a deep, warm bath at Cómpeta’s Hotel Balcón. I tried to encourage a few people to walk a couple of hundred metres to visit the pretty plaza and El Paseo de las Tradiciones but was ignored as people tended to blisters, pink shoulders, and an irresistible desire for a cold beer on the terrace. At dinner, balloons and a cake marked John’s 50th but there were no late-night celebrations as we all knew the next day was the hardest. Though perhaps at this point it is worth pointing out that about 50% of the group was Irish, so the evening was not complete without a degree of midnight singing. It was his birthday after all, so it was. Day three was the main reason I had signed up for this. 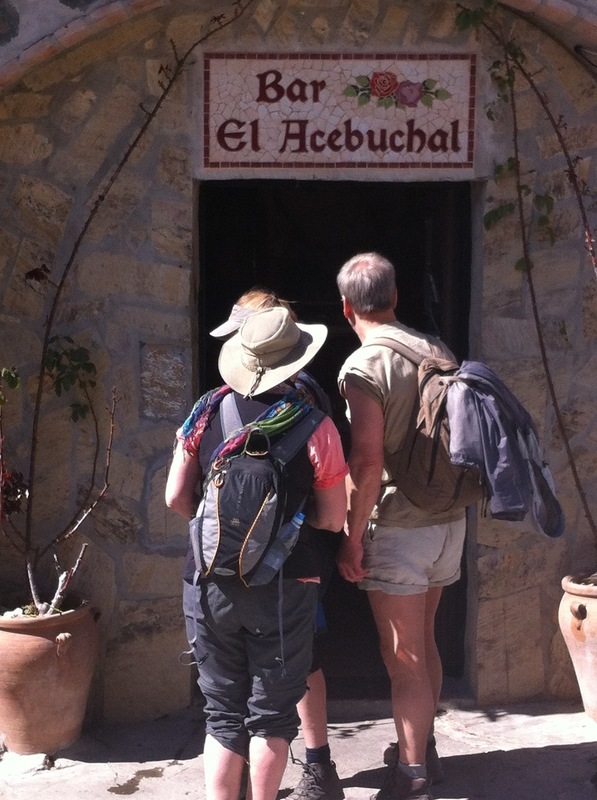 We were walking to the hidden village of El Acebuchál – something I had longed to do since reading about it 18 months ago. The group split into two. The “hard-core” taking the high road and about one “turd” taking the low road. John handed me the second radio, we exchanged mobile numbers for back-up, and we went our separate ways. Our group (the low route, in case anyone was wondering! ), reached the planned meeting point early, having had a beautiful but flattish walk. As agreed, I radioed to John to confirm our position and tell him we would carry on. The radios had approximately 2km range, but we hadn’t accounted for the massive great mountain between us and the other two “turds”. I kept trying, occasionally receiving an incomprehensible crackle back. And then the batteries died. No phone signal either, of course. I pulled an empty peach juice carton from my rucksack, the fantastically well-equipped Jane produced a length of wool from hers and we tied it to the fingerpost at the path junction with a note saying we were heading for El Acebuchál. Contouring round the headland later, we looked back and saw the group on the track, probably about 40 minutes behind us. Mad waving across the ravine, and with communication restored the sight of the others for some unaccountable reason put a spring in our step (competitive, moi?) and we strode on, waking up the wasps in their nest ahead of the main group (! ), until finally we turned down into the dry river bed for the final march into El Acebuchál. For me it was a disproportionately emotional moment. I had no aims from this Gran Ruta other than to enjoy myself and stretch the leg muscles. I didn’t mind if I didn’t complete the whole thing. But I DID want to walk into El Acebuchál, and I had done it. 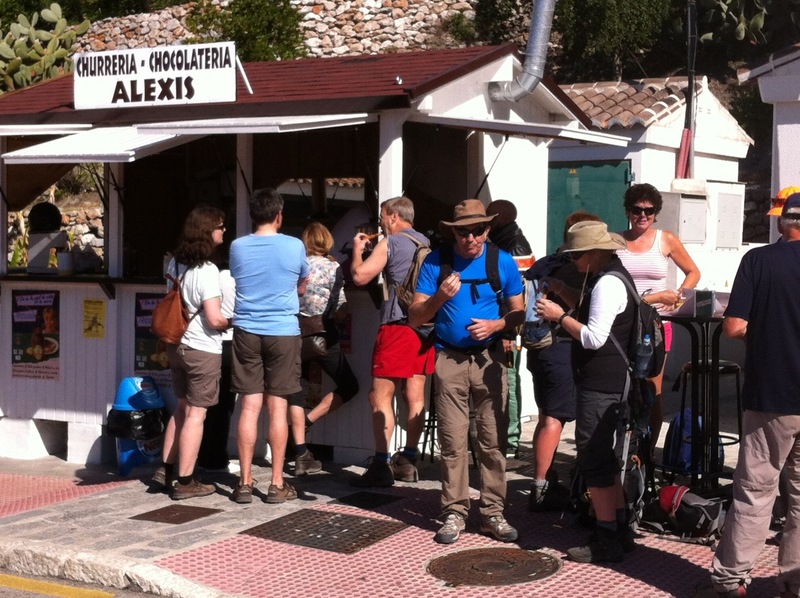 We colonised the bar, warmly welcomed by Antonio and his family, got in a round of the famous Acebuchál cakes, and just 15 minutes later we welcomed the high-level walkers with a round of applause for their achievement. After his first drink (or three) I thought I’d better return the now-useless radio to John. He packed it away then looked up with a twinkle. “Tamara”, he said, “I need to say this to you”. A mischievous grin and then he said “Tomorrow, Tamara, to Maro!” He’d been working on that one all day. To be fair, it is the first NEW joke I’d heard about my name in over 30 years! And, to be fair, it was a cracker (so it was). After settling into the sweet little cottages around the village we returned to the bar terrace for our final evening meal together. And what a meal! Roasted peppers followed by home-baked bread and oil, a massive salad, then chicken, pobre patatas, then jabalí (wild boar), rice, coconut curried pork, wine, cake, and coffee. More great rural hospitality. All around me there were satisfied murmurings of “Aah, that was grand, so it was.” Even the English in the group had inadvertently soaked up some Irish-isms. The last morning dawned. My duties as unofficial bag-transport organiser almost over, I collected final contributions and checked with Antonio that the bags would be at Salva’s bar in Maro by 1pm. The whole group walking together again, we strolled down to Frigiliana for the first of the farewell points. Hot chocolate and fresh churros from Alexis and that was where my Gran Ruta ended. A music event that night in Málaga followed by a flight to England the next day meant it made sense for me to jump on the bus to Nerja, nip up to Maro to pick up my bag from Salva and head straight home. Others dropped out at Frigiliana for different reasons, some took the shorter road route down to Nerja, while those determined to do every yard of the official route continued via the GR 242 to the final celebration and farewell. I salute them – they did well. As in life, every walker fights their own battles, overcomes their own demons, and values their own achievements. Not every one of the 30 walked every yard. Blisters, sunburn, recent surgery, exhaustion, injuries and music concerts got in the way. But every one of the 30 can chalk up their own success, each one knows what they overcame and what they accomplished. The photos filling John’s Facebook page tell a story of friendship, happiness, pain and triumph. Ah, it was a grand route. So it was. day walks, usually out of Nerja or Frigiliana. The walk to El Acebuchál runs most Wednesdays. Details of that and his other walks are on his website http://www.hikingwalkingspain.com/ or you can find John on his Facebook page https://www.facebook.com/JohnKeoghWalkingTours. “The Long Walk” was a one-off event covering 50 miles for John’s 50th birthday, for a €50 donation to Cudeca, the local cancer charity. Along with sponsorship raised by individual walkers, at the last count John’s birthday walk had contributed €2000 euros. So it has. Note 2 – Due to the length of this post, language points will return in the next blog post. So they will. This entry was posted in Spain and tagged Axarquía, El Acebuchál, John Keo, Nerja, Periana, Spain, SpanishBlog, walking by tamaraessex. Bookmark the permalink. A great post, Tamara, and a great walk. I’m even keener to visit Acebuchal now! Sounds like a fantastic hike!! Congratulations to all and for such a great cause as well. Next time I’ll have to join you. Really enjoyed your blog Tamara. I have a friend who lives near Romanes at Lake Vinuela and love the area. Have just found your blog Tamara courtesy of Saga Magazine! I find it most interesting and loved the vivid description of your recent walk, I too fel I was there. I will certainly keep logging in to you in the future. I’m reading this again a couple of years later. It was a great walk and I really enjoyed your company on it. I was one of those who turned down the visit to the plaza in Competa I have regretted it.